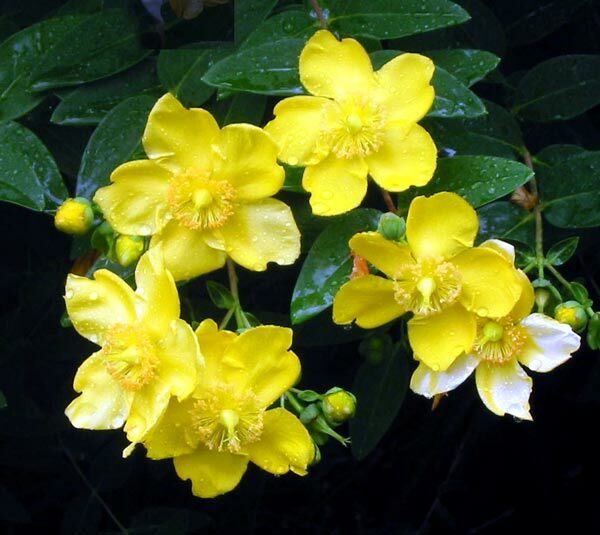 Hypericum is a great summer shrub - it flowers right in mid-summer and brings yet more sunshine to the garden with its bright yellow flowers. Sometimes my Hypericums will flower spasmodically in Autumn, too. The type that I grow is the normal work-horse shrub - nothing fancy, just an incredibly strong doer. I can turn into the pruner from hell and my Hypericums don't even whimper. In fact they seem to appreciate my severe cutting expeditions (which I try to embark on in the correct season, immediately after flowering). 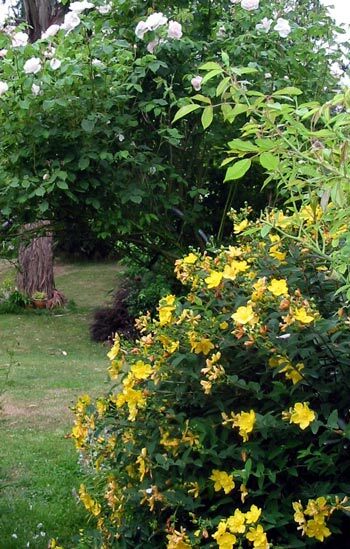 One of my shrub books suggests cutting Hypericum down to the ground every three years! And I'm quite certain that this type of treatment wouldn't hurt Hypericum one little bit. So you might infer from this that the shrub is impossible to get rid of, short of digging it right out. And you'd be right. It's nicely easy-going, and tough, safe from gardener interference. Both my original Hypericums were in the garden when I first arrived. I've grown a few extras from cuttings, which have been useful helping to fill out new gardens. This year one of the plants is covered in flowers in autumn - I think I gave it a gentle prune after its first summer flowering. There is also a ground-cover Hypericum. I tried it out in one of the Pond Paddock borders. It was semi-invasive, and although covered some rather dry and uninspiring ground it was a mistake. It was hard to keep it contained, and every summer I was full of plans for totally removing it. The foliage was very scruffy, too, though the golden yellow flowers were nice. Lesson learnt. A common name for Hypericum is St John's Wort, which sounds rather odd. This name is derived from its traditional flowering and harvesting time, on St John's Day, 24 June. That's in the northern hemisphere, by the way. It has uses as a herbal remedy.